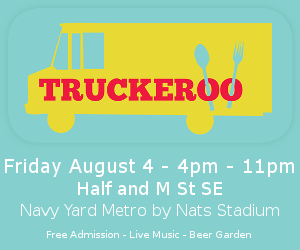 The next Truckeroo will be held on Friday, August 4! Join us at the DC Fairgrounds (Half St and M St SE) across from the Navy Yard/Ballpark metro entrance for delicious food truck fare, covered & uncovered seating, music and games! Hours for this Truckeroo are 4pm – 11pm! « Sept. 22 Truckeroo Truck List Announced!